So, summer camps are just what I do (it’s an irrational compulsion) and Italy is a place I just get (possibly also an irrational compulsion, or maybe that’s what real love is). Over repeat visits this natural affinity has grown and, even though I can’t shake off my Britishness and am far from fluent in Italian (ways and language), I think that there is something strong deep inside tying me to the place (and/or the Italian spirit). I really realised that when I left Milan in April after a two-plus months stay and stopped by Zürich for three days – it was nice, but simultaneously alienating. I felt foreign where I don’t feel totally foreign in Italy. 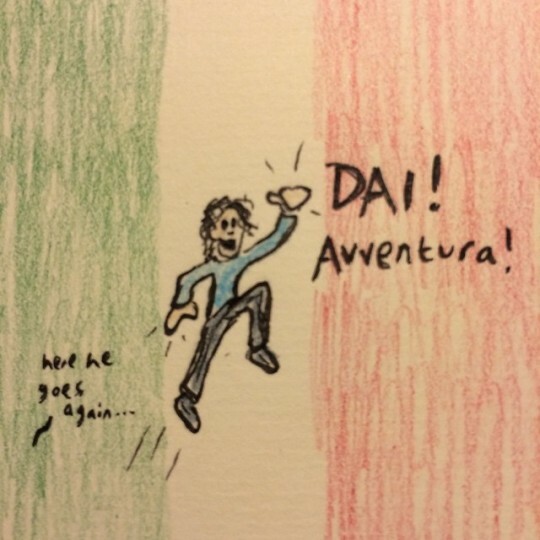 I could ramble on, navel-gazing and analysing my relationship with Italy (and indeed myself and the wider world) but I should really be packing, so I’ll leave this short and sweet. Just know that I’ll be in Italy for a month doing my things (gesturing wildly, awkwardly mangling the Italian language, trying to teach the English language to Italian kids, exploring and generally having an array of adventures, etc.). Because I aim to travel light (*the Universe laughs at such delusion*) and because I want to unplug a bit, I’m not taking this laptop and, thus, regular services and communication channels may be a bit erratic. I may occasionally fling something out on Twitter or some of my doodling on Instagram but it depends. My energies and mind are all going to be directed towards travelling, summer camp work and creative activity in notebooks. Oh, and hanging out with good people, searching out good pizza and soaking up the art, history, culture and overall experiences on offer in Italy – my home-away-from-home. Allora! The post-exile re-organisation continues apace and that involves going through bags, plastic wallets full of printed paraphernalia, photo archives on digital devices and much much more. One of the plastic wallets contained these: paper dinner placemats I doodled all over during my two-week stint working as an English tutor at a summer camp for Italian children in the town of Candiolo just outside of Torino. Sketching is fun. It’s even more fun when you do it with enthusiastic children during lunchtime. What follows is a pictorial diary of the fortnight, all of the instalments quickly inked up in the half-hour breaks from all the singing and silly games when I got a moment to free-create a bit while quickly cramming some pasta in my mouth.